The Dioptinae are an almost exclusively neotropical group of day-flying moths, many of which exhibit bright wing coloration and are involved in mimicry rings with butterflies (especially Ithomiini), sterrhine Geometridae and various arctiids. The two specimens illustrated above are representatives of the type species of Dioptis and Josia, the type genera of the two tribes indicated here. Small, delicate, mostly day-flying Notodontidae which are frequently confused with similarly marked Arctiidae and Geometridae. Miller (2009) points out that the easiest means to distinguish a dioptine is by (1) presence of a metathoracic tympanum, which separates it from Geometridae, whose tympana occur on the first abdominal segment; and (2) a trifid forewing venation, as opposed to quadrifid venation in Arctiidae. Although numerous authors have described individual species of Dioptinae, the list of works cited below includes historical and modern efforts to revise the entire group. The classification presented here and in subordinate branches is based on the most recent of these (Miller, 2009). Bryk, F. 1930. Dioptidae. In: E. Strand (ed.) 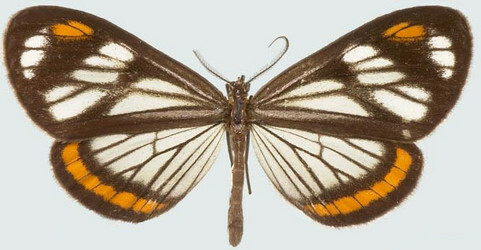 Lepidopterorum Catalogus 42: 1-65. Berlin, W. Junk. Hering, EM. 1925. 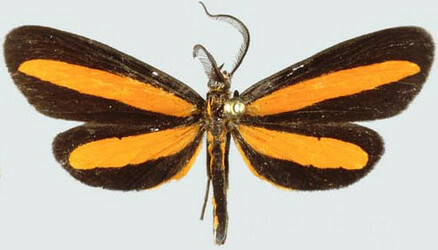 Dioptidae. In: A. Seitz (ed.) Macrolepidoptera of the World. 6:501-534. Stuttgart, Alfred Kernen. Prout, LB. 1918. A provisional arrangement of the Dioptidae. Novitates Zoologicae 25: 395-429. Page: Tree of Life Dioptinae Walker 1862. Authored by James S. Miller and Andrew V. Z. Brower. The TEXT of this page is licensed under the Creative Commons Attribution-NonCommercial License - Version 3.0. Note that images and other media featured on this page are each governed by their own license, and they may or may not be available for reuse. Click on an image or a media link to access the media data window, which provides the relevant licensing information. For the general terms and conditions of ToL material reuse and redistribution, please see the Tree of Life Copyright Policies.